I used to love to read about the strong alpha males that Johanna Lindsey wrote about in books like the Mallory series and Angel. I grew up with tough men, and strong women of the west, so I related to these stories. My father was an old mountain man. His love for the real Wild West came though to me when I was very young. I loved the feel of what he described. My great-grandmother was a true pioneer woman of the old Wild West, born in 1886, and a mid-wife and healer in a very small town that no longer exists in Montana, and she used to tell me stories when I was a child. In Montana, my great-grandmother was one of the many pioneer women who made her way in the Wild West. She worked. She toiled. She raised three children on her own when her drunk husband took off and left her in the the small town of York, Montana. And I quickly learned a small child--she may have been under five foot tall, but even in her eighties and nineties, you didn't want to let that fool you--for her spirit, her fight, far out-weighed anyone I had known, then, or since. She was, and still is, the toughest lady I have ever met. And whenever there were times in my life, whenever I thought my own journey had become much too tough, I would stop and think--how on earth had she done it? I would think about all the brave women who helped to make America, and I would be inspired--never quit. Never say die. And never let the enemy know he almost had you. Growing up I dreamed about everything horses and imagined owning a large horse ranch. I'd see the whole story in my head, so I guess that in a way I was writing stories even then. Then I began reading romance, and the Wild West seemed to me to be the perfect lover for my love of writing. 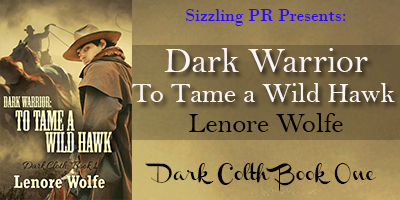 In my first romance novel, Dark Warrior: To Tame a Wild Hawk? 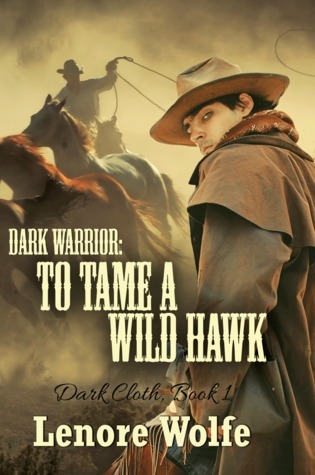 Dark Warrior: To Tame a Wild Hawk is a journey into the Wild West with Hawk where you first meet a six year old boy who witnesses his father and renegade friends kill every single one of their friends on the wagon train with whom they were traveling west. You next follow the boy on a journey, set in motion that day, as he meets his destiny when a Cheyenne warrior finds him and adopts him into their clan. And get a glimpse of that destiny through the warrior's eyes, when he witnesses the way the boy looks out across the prairie grasslands at his dead friends littering the ground whose sightless eyes stare up into the deep blue sky, and knows--the boy would not rest--until his friends no longer cried out to him in his sleep. Amanda Kane has always had visions of the man she's destined to marry—a cowboy who will help her save her ranch. But Hawk is no ordinary cowboy. He carries a powerful secret. A secret that leads to betrayal. She spent years with a secret society of Lakota women, who taught her the ancient ways. Now, she must seek the Grandmothers, from beyond the veil, if they are stop a man behind a mask. Amanda Kane has spent years with a secret society of Lakota women, who taught her the ancient ways. She has sought the help of the Grandmothers, from beyond the veil, to help her stop the man behind the mask. They point her to the visions she has always had of the man she’s destined to marry—a cowboy who will help save her ranch. But Hawk is no ordinary cowboy. He carries a powerful secret. A secret that leads to betrayal. He was magnificent—standing there, waiting for her to reach his side. And soon after she did, their lives became irrevocably woven together. Mandy likened it to a silvery, invisible thread, joining their hearts. And she knew the Grandmothers smiled. She felt rebellious right now with their sure vision of her path. A path with Hawk ... their lives entwined. Her heart pounded—fanciful thoughts. But her mind soon followed down the path her heart had taken, with what would have been—could have been—had she not insisted this marriage be in name only. “Second thoughts already?” his whisper caressed her face. She shook her head at Hawk. “No, the marriage has its merits,” she answered, trying for a neutral tone. Startled, she looked up and was captured, completely off guard, by the intense look in his gold eyes. He’d read her mind again, drat the man; or was her body giving her away? She should look away—really she should—but suddenly she couldn’t remember why. “Give over, Mandy,” he whispered. His gaze refused to release her from the fine thread he was weaving around her. She was caressed by it—captured by it. And each time, the web grew stronger. “You want this marriage in every way, every bit as much as I; admit it, Mandy.” His low voice fanned the flames. Mandy opened her mouth, then shut it. She fought for control, lost, and opened her mouth again, but the words of denial wouldn’t come. His hand touched the side of her face, his thumb sliding possessively over her lips, stroking her bottom lip again and again until she thought she would faint with pleasure. She’d made a fatal mistake with her heart, thinking she could control this. She should have listened to the danger signs—to all the warnings, and now it was too late. There was no holding back—any part of her; at least, not anything strong enough to hold back this tide of love—and desire. Even though the love part lay only on her side. And her heart was going to pay the price; but she couldn’t stop now. Hawk’s intense, green-gold eyes searched her face, and knew the exact instant she surrendered, and only by iron will did he wait to hear the words. Words avowing her complete surrender. Lenore writes dark fantasy, paranormal romance, fantasy, historical romance. She grew up in Montana and Alaska, and currently lives in the central US. She holds a BA in Sociology from the University of Northern Colorado, with a minor in writing and is a student of the Shaman path.